Strangelove NYC (previously known as ERH1012) will launch Melt My Heart, the brand's followup to 2014's Dead of Night. Melt My Heart was developed by perfumer Christophe Laudamiel. The notes feature ginger, bergamot, nutmeg, sage, oud, dark chocolate and orris butter. 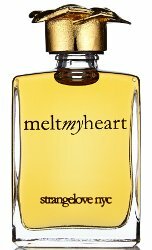 Strangelove NYC Melt My Heart will be available in 3 x 1.25 ml with pendant necklace, or in 10 or 15 ml Perfume Oil. An Eau de Parfum version is expected to debut in 2016. Strangelove is easier to pronounce than ERH1012, but I can’t think of anything else than Dr. Strangelove, which doesn’t make me think of perfume either. Plus they don’t seem to emphasize the brand name anyway. It isn’t even mentioned in the WWD article, or in any other article about them I’ve seen. Odd! The cap looks like Donald Trump’s hair. I guess they are getting into spirit of the season. He made their 1st scent too. Melt My Heart – another name that makes you wonder that one had ever used it before.